It’s raining. Two days now. But I’m okay with that. Rain means the garden is getting watered and the soil will be easier to dig. What am I digging you ask? Well I’m not saying it’s a grave but I’m not saying it’s not a grave. Let that little mystery stew in your mind for a little while. But for now let us move to another subject. Color. When doing most crafts, sewing, etc. I mainly deal in red and black but for the special people in my life I will venture beyond my two favorite colors. A good friend and co-worker turned 21. Twenty-first birthdays MUST be celebrated. This young lady loves everything tye dyed. I saw on Pinterest a few weeks ago a tye dyed cake. So like flies on a dead body I was all over the cake challenge. The frosting is white. 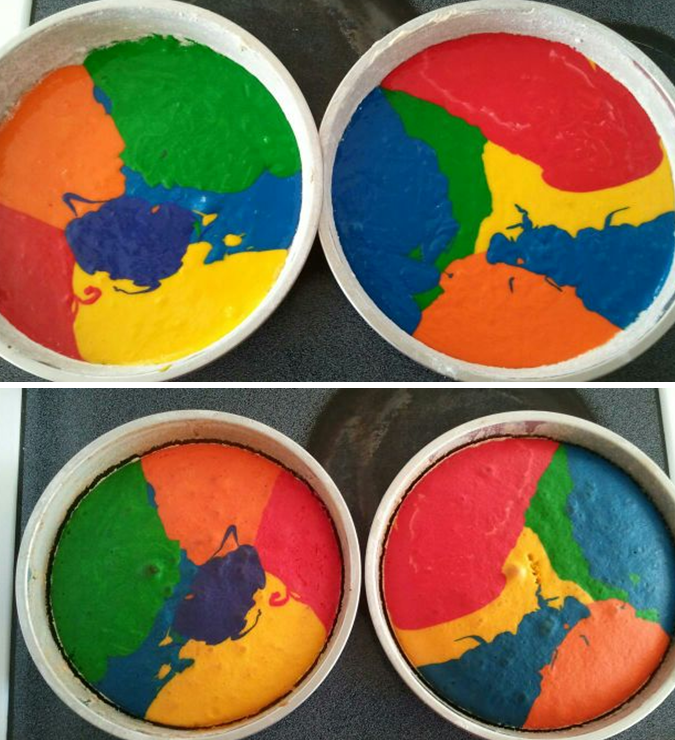 The tye dye effect is in the cake mix itself. Very simple recipe with a BIG effect. I bought the stuff to make two cakes just incase things went bad I had a back up cake I could make. I couldn’t let my friend be cakeless on her birthday, the BIG 21! Coloring for icing. 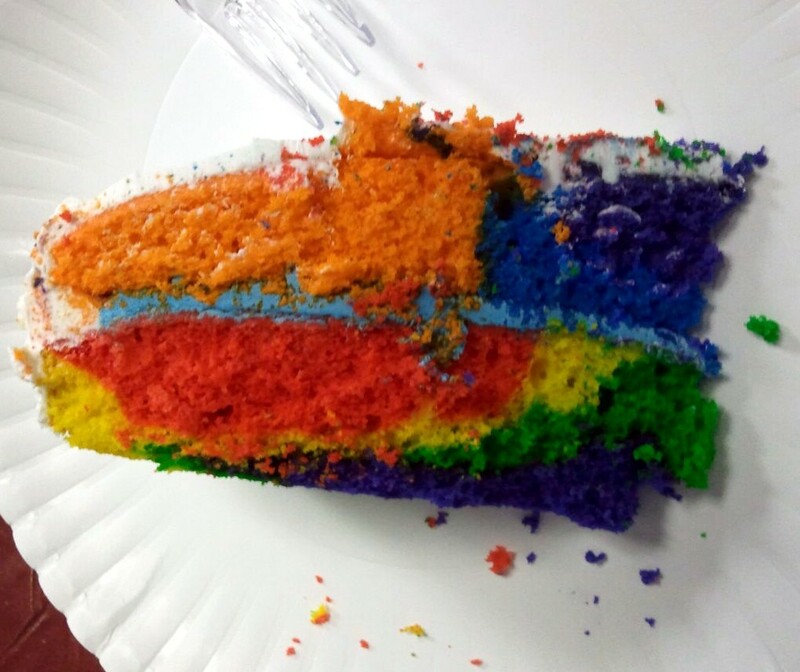 Food coloring or concentrated frosting color gel. Six bowls, one for each color. Mix the cake mix according to box. Or from scratch if that’s how you bake your cakes. Let me add here that I use coconut oil. If you have never baked with coconut oil let me tell you a bit about it. Coconut oil is solid like lard. But has a low melting point, 76 degrees I think. I spoon it into a microwavable measuring cup and put in microwave for 20 seconds. You may have to zap it a few extra seconds. Once it is in a liquid state measure out what you need. This is what it has done to my cake mixes: it gives it a whipped texture, light and fluffy. So it’s easy to control your batter more. (If it’s hot in your house you may not get that whipped batter texture, I found this out the day I made this cake. It was 86 that day and we hadn‘t put in the air window units yet so it was a tad toasty in house). Divide mix in the six bowls. Mix a different color in each bowl. You are suppose to pour the mixes in a circle. First color big circle, next color smaller circle and so on till you have used the six colors. Do the next pan same but with the colors reversed. Yeah…for some reason I could not do that. My mix ended up, well I will let the pictures tell the story. I also had a tough time judging how much mix I was putting into each pan. The result one layer thicker than the other. The bottom layer broke into two pieces but a little icing between each layer fixed that right up. 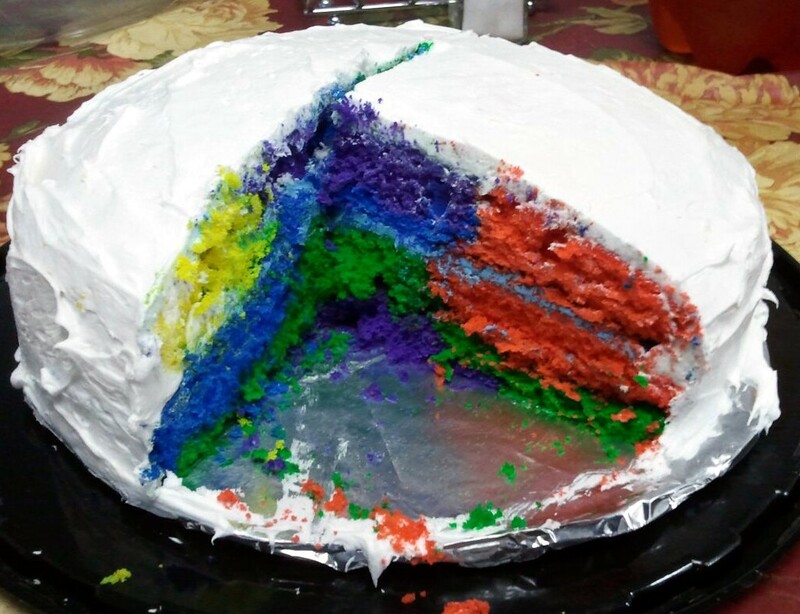 I did color the middle icing blue so it would blend it when the cake was cut. The day before I baked the cake I told the birthday girl I was experimenting with her cake and that if it didn’t work out she would get a white plain Jane cake. I frosted it white and took it to work. I told the party girl the cake didn’t work out. Imagine her surprise later that day when she cut her cake. She was very happy. I told her not to drink to much that night or she made end up with some very colorful vomit. I wanted the cake to be perfect, it wasn’t. It had a few flaws. But the day wasn’t about a perfect cake it was about celebrating the birth of a great person! So the party was a huge success. And yes I am dragging my friends along, usually kicking and screaming, on this Pinteresting journey.